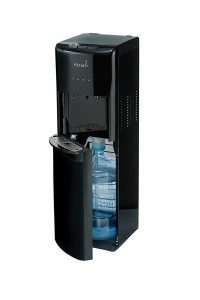 Black Primo B150 is a sleek and modern, best seller cold and hot water cooler and dispenser with a bottom loading design. You’ll have access to very cold or piping hot water on demand, with the touch of a single button. It includes a 3.5-liter stainless steel water reservoir and a decent cooling system. The rating is 4.1 out 5 stars by 68 customers on the day of this review. You’ll get water coupons included in the box, that you can redeem at many retail stores in the US. The two-step child resistant safety feature that prevents inadvertent dispensing makes it great for families with small kids, as there won’t be any burning accidents. There will be no lifting, flipping or spilling thanks to its convenient bottom loading design as you simply slide the bottle into the cabinet underneath. You won’t need any tools for setting it up- the assembly is very easy. You just place the drip tray in place, plug the cap, slide the Primo water bottle into the cabinet, and start getting hot or cold water immediately. The bottom cabinet for water bottles also gives it a nice and clean look. As this unit works with these 3 or 5-gallon water bottles only, there won’t be any need for plumbing and you can use it anywhere there is a power outlet. The drip tray is easy to remove and is suitable for being washed in the dishwasher. Stainless steel water reservoir will prove durable over time and will help give you pure and tasty water consistently. 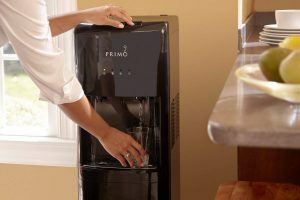 We advise that you use the Primo Purified Water with Minerals or choose to refill your bottle at a self-service station of Primo. With the multi-step reverse osmosis you’ll enjoy very good quality water. Primo B150 (601088) is easy on the eyes with a sleek and modern design weighs 44.9 pounds and measures 14.2 x 12.2 x 40.9 inches. The bottles are easy to load but there will be a little bit of water left at the bottom of each bottle. Despite having a powerful cooling system it runs very quietly and you shouldn’t experience any leaking. The 5-gallon bottles of water costs less than two dollars at the stores, so you’ll be saving on your water costs too. This is a UL certified unit for safety and Energy Star certified for less power consumption. You can expect the cold water to be at around 40 degrees Fahrenheit and the hot water to be hot enough to use in instant noodles, porridge or hot beverages. There is no light on the dispenser tray if you prefer one with it so that you can see your glass filling in the dark. And for all that it offers, in terms of design, functionality, security and durability it is sold at a great price. This is a very good quality product with very quick delivery and decent warranty of one year by the manufacturer and great customer support as back-up.